Using an oblong watermelon, slice ¼ inch off an end to provide a stable base. 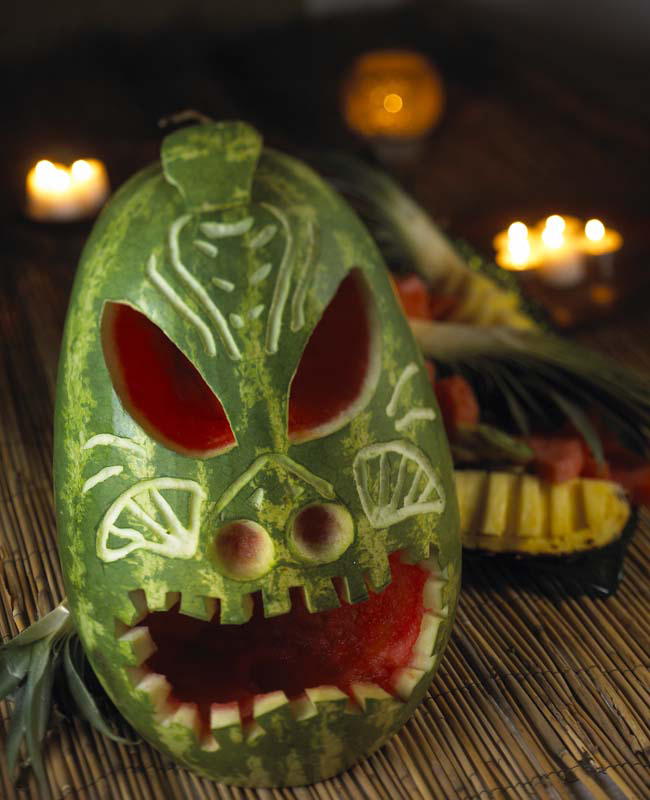 Use a pencil to draw the face, making adjustments in scale to your particular watermelon. Use a melon baller to scoop out nostrils - use a small paring knife to clean up edges. Next use a paring knife to cut out the inside mouth area, leaving room for the teeth. Next cut the individual teeth, using the same small paring knife, and use a spoon to dig out a large area of flesh for mouth cavity. Next carve out eyes, digging a deep cavity in each, for drama. Use a channel knife to carve details. Use some carved out pieces to cut a "bone" decoration for top of head, and attach with a toothpick.